Product prices and availability are accurate as of 2019-04-21 19:37:00 UTC and are subject to change. Any price and availability information displayed on http://www.amazon.com/ at the time of purchase will apply to the purchase of this product. campgrounds, and much more. The lantern features bright and portable, which store effortlessly and carry at ease. 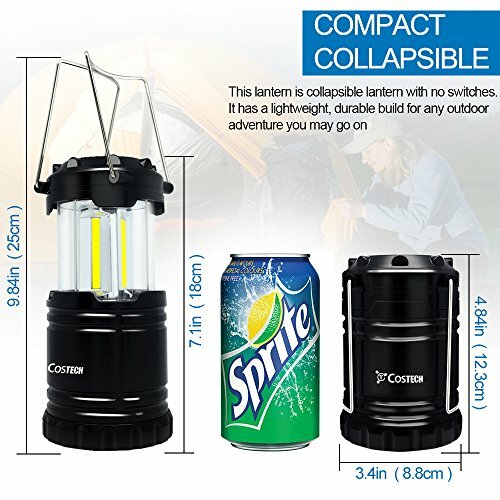 This lantern is collapsible lantern with no switches. It has a lightweight, durable build for any outdoor adventure you may go on, produced from military grade plastic. COB low-current consuming, yet bright and durable designed to save battery life and prolong usage over 12 hours. 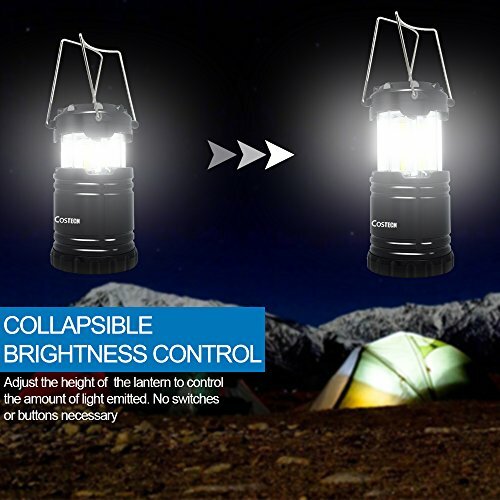 Ultra-Bright CAMPING LANTERN: with the latest technology, COB Lighting illuminated larger areas with more light than the common 30 LED lantern. 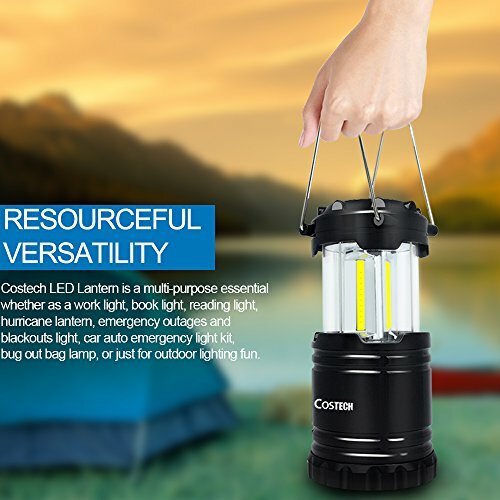 This High-Quality lantern is multi-purpose light, providing 360 ultra-bright light, whether as a work light, book light, reading light, emergency outages and blackouts light, car auto emergency light kit, or just for outdoor lighting fun. 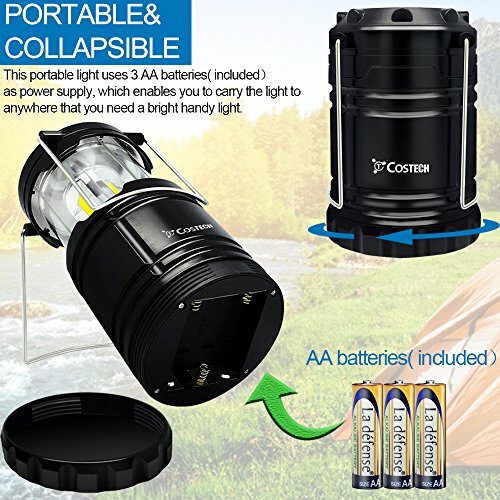 Easy to store and you can take everywhere PORTABLE& COLLAPSIBLE - This portable light uses 3 AA batteries( included? as power supply, which enables you to carry the light to anywhere that you need a bright handy light. The advanced collapsible design also makes using and transporting the lantern super convenient. DURABLE & WEATHER RESISTANT- It is extremely durable, as it is made of extra tough, military grade plastic. Its superior construction allows it to be compact, portable, lightweight, durable, and water resistant. INDOOR OR OUTDOOR USE- It is extraordinary versatile. Use it while camping, fishing, power outages, auto maintenance, highway emergencies and more. Keep it in your kitchen cupboard, or add it to your emergency kit are also useful. 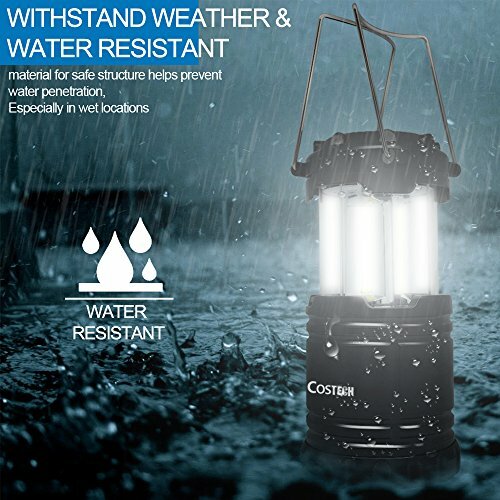 LIFE SAVER IN ALL SITUATIONS: Enjoy the great outdoors without second guessing if you packed everything for your nights - with over 100,000 hours of LED bulb life span they out do any candle camp lamp, with the lightweight, compact, and portable design, the Costech LED Lantern is a multi-purpose essential whether as a work light, book light, reading light, hurricane lantern, emergency outages and blackouts light, car auto emergency light kit, bug out bag lamp, or just for outdoor lighting fun.